SPRINGFIELD, Ill. – The cryptic note penned by Abraham Lincoln identifies its recipient only as “my dear Sir” and has a small section carefully clipped out. Who was he writing to and why was a key piece of information later removed so meticulously? Historians believe they have unraveled the mystery and uncovered a bit of political intrigue in the process. Researchers at the Papers of Abraham Lincoln project concluded Lincoln was writing to an ally to ask him to maintain a secret relationship with a political insider during the 1860 election campaign. Lincoln asked his cohort to “keep up a correspondence” with the person, a phrase that gave researchers their best clue. They ran it through a searchable database of Lincoln’s papers and found several matches. One was in a letter to Lincoln from fellow attorney and Republican Leonard Swett of Bloomington, Ill. The two men, it turns out, were conspiring to keep tabs on a New York political figure. 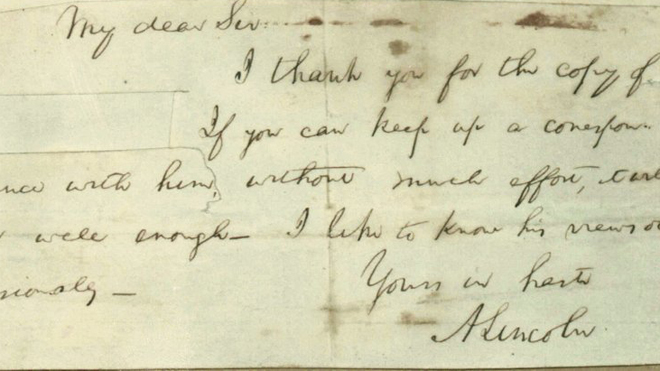 The mystery note was Lincoln’s response to Swett’s letter, the researchers surmised. Swett’s earlier letter also had a clue about who the political insider was. It referred to “our friend TW of Albany,” who researchers concluded was Thurlow Weed, a Republican newspaper editor and political boss of New York state. Lincoln was seeking Weed’s support in New York, even though Weed had been backing front-runner William H. Seward for the Republican presidential nomination. Lincoln got his way, ultimately winning Weed’s support. Seward later became his secretary of state. But Lincoln couldn’t be seen as close to Weed during the campaign so he recruited Swett to be a secret go-between. That also explains why Swett clipped Tweed’s name from Lincoln’s note. A New York City manuscript dealer recently contacted the Papers of Abraham Lincoln for help solving the riddle. The group of researchers is trying to identify, transcribe and publish all documents written by or to Lincoln. Project Director Daniel Stowell said Saturday that solving the mystery behind the note points to the project’s value. “To be able to identify the date, recipient and subject of such a brief letter is a remarkable achievement,” he said.